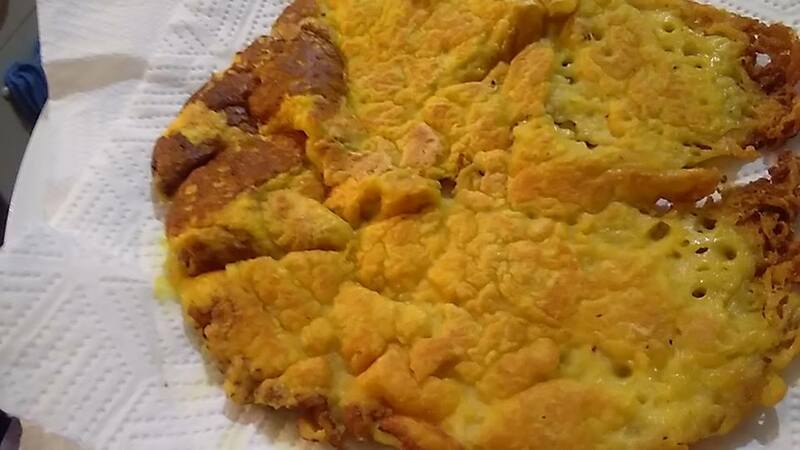 Eggless frittata is the new yellow! I went a bit crazy tonight in the kitchen as I am running out of food in my pantry and this week has been hellish with no time for some proper shopping. Had to come up with a decent and nutrition idea for our work lunches tomorrow and dinner tonight, and so there you go! Ladies and gentlemen (…drum rolls…) please welcome to the world the star of this evening: a delciously eggy, bubbly, tasty vegan omelette made using as a main ingredient…a can of cannellini beans! Hell yeah! Isn’t she a stunner? 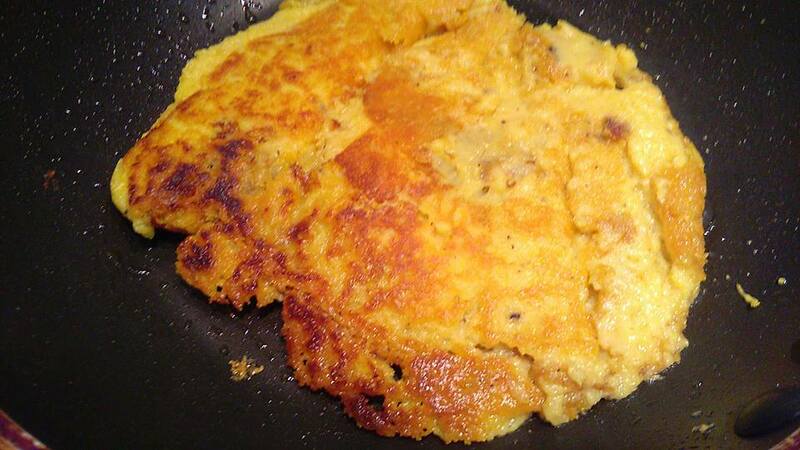 I prepared these just like pancakes: a non-stick frying pan is required, as is your patience. 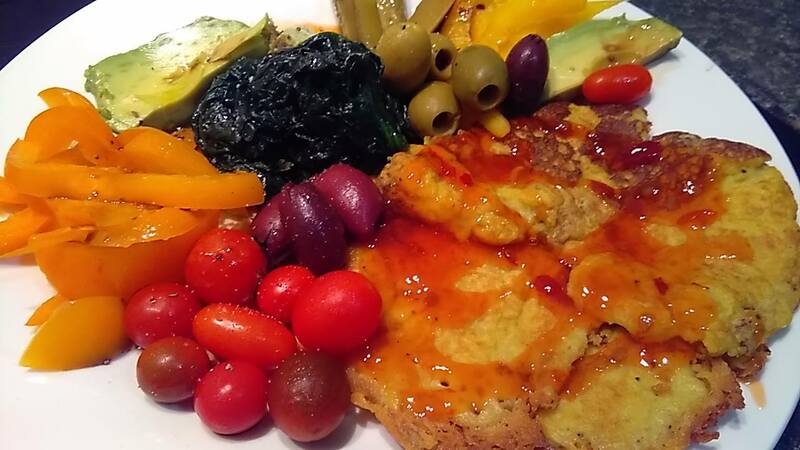 I have tried different vegan omelette recipes before, but I believe with this one I have achieved an ideal elasticity and taste. 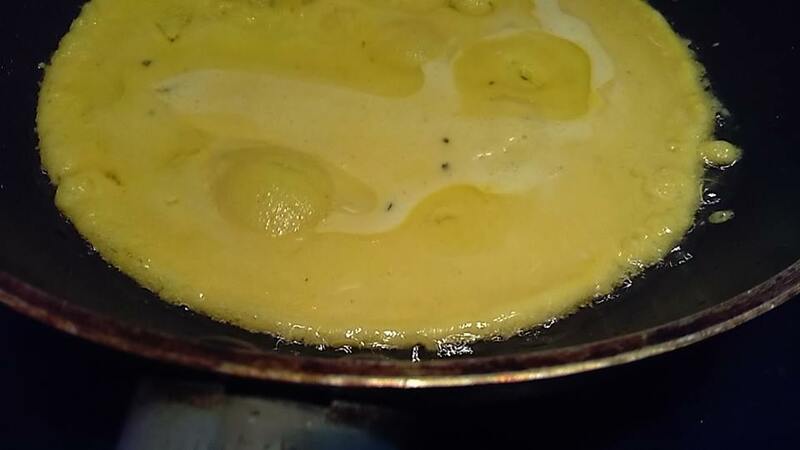 It even bubbled in such a similar way to beaten eggs when I poured the mixture in hot coconut oil. Now I guess you guys need a recipe? Well there you are! Please share with your friends, even if not vegan. Not only is this omelette cholesterol free, but, mostly importantly ,is also cruelty free. In the US only, every year hundreds of thousands of male chicks are ground alive, tossed in dumpsters, killed in the worse possible way by us ‘civilized humans’. Every time you eat anything containing eggs, you support this barbaric practice. There are alternatives out there, and they are cheap and healthy! Save your heart, save other lives. Go vegan. Put all the vegan omelette ingredients in a blender and blend until you achieve a smooth consistency. It will resemble to raw eggs ready to be poured in a pan. Heat a small quantity of oil in a non-stick frying pan. I used a quite small pan as I think it;s easier to manage, ie.flip, a smaller omelette rather than a larger one and I also wanted to make more smaller ones. Now you need to be patient and let cook. Use medium heat to avoid burning, and allow to cook until the texture feels ready to be flipped (hard enough on the bottom side). I make things easier by just covering the pan with a lage plate as it was a lid, then flipping the whole thing into it. It requires practice, just like an egg omelette. If too complicated just use a large spatula! I also noticed that the first omelette wasn't as perfect as the last ones. For some reasons this happens also when I make pancakes. Maybe it's the heat of the pan? Anyway...it's good in any case! Lovely! Aquafaba is fantastic isn’t it? Changed my life 🙂 + I love cannellini beans.